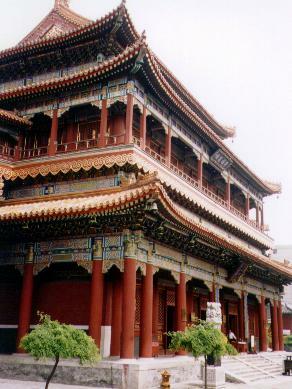 In the northeastern part of Beijing stands Yonghe Lamasery, a Yellow Hat Tibetan lamasary and one of the city’s finest and most celebrated temples. Its 5 main halls and many galleries are filled with exquisitely detailed tanka paintings and beautifully carved or cast Buddha images. The Yonghe Lamasery was originally built by order of Emperor Kangxi in 1694 to serve as a residence for his son and successor to the throne-Yinzhen. The buildings encompass the Han, Mongol, Manchu and Tibetan architectural styles and the brilliance of the blue, green and gold detail on the sharp red pagodas is simply stunning. The temple is renown for its "3 matchless treasures". These include an 18 meter (60ft) sandalwood Maitreya Buddha statue sculpted from a single tree, a niche of Buddha carved from the nanmu tree and the "mountain of 500 arhats" made of five kinds of metals--gold, silver, copper, iron and tin.